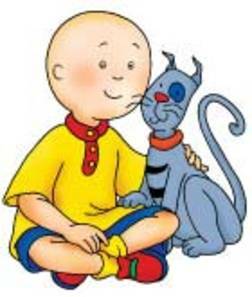 The Canadian cartoon Caillou was on PBS from 1997 to 2010 and is a delightful character loved by many kids. Based on the books by author Christine L’Heureux and illustrator Hélène Desputeaux. During the first season, many of the stories began with a grandmother (who is also the show’s narrator) introducing the story to her grandchildren, then reading the story about the book. Since 1997, the narrator/grandmother is an unseen character. We have collected some of the cartoons for you in French, English and Spanish. You can find bilingual children’s books in these languages at our bilingual children’s books page. For more cartoons in French visit our French cartoon page,, and to give your child or grandchild ahead start consider the award winning Little Pim DVD series.